Mystic Shuffle Hi Lo is a bog-standard hi-lo game. The aim of the game is to guess hi or lo on as many cards as possible that range from numbers 1 to 20. It plays very similarly to Aces High, which unfortunately didn’t score too well either. 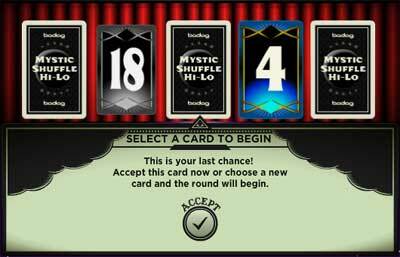 The unique aspect of Mystic Shuffle Hi Lo is the bonus feature. With every correct guess you will add a set amount to your percentage multiplier. 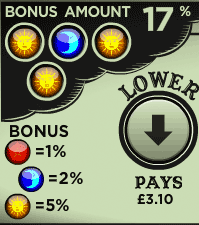 This percentage multiplier is then awarded after every 4 or 5 correct guesses. 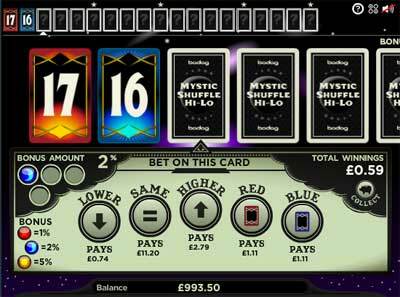 In a nutshell, Mystic Shuffle Hi Lo is a very basic hi-lo game with only a mildly interesting bonus feature. If you want to play an eventful hi-lo game, try 4 Play Hi Lo Bingo instead. The overall fun rating - 47%. Mystic Shuffle Hi Lo is surprisingly frustrating. You always seem to lose out on the most innocent of numbers. Honestly, I don’t think I’ve ever come a cropper guessing low on 18 or high on 3 on any other hi lo game. Combine this uncanny tendency to lose with the painful incentive to get 4 or 5 consecutive correct guesses (to get the bonus multiplier) and you’ve got a real infuriating game on your hands. I’m not suggesting that the game is unfair in any way, but more that I believe Mystic Shuffle Hi Lo is very good at making you think that you have more chance of winning than you do. Therefore, the only thing Mystic Shuffle Hi Lo is good at is being a pain in the a**, which unfortunately doesn’t make for an impressive "fun rating". Playing Mysic Shuffle Hi Lo. The basics of Mysic Shuffle Hi Lo. Guess hi, lo, same, red or blue on each card. 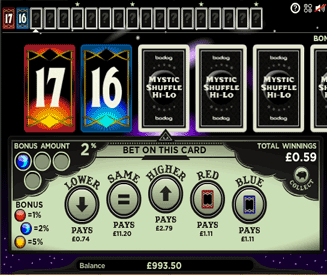 Collect your winnings at any point or continue and gamble your money for bigger wins. I’ve neglected to mention the small bonus feature in this basic guide, but it’s so small that you could probably miss it whilst playing the game anyway. After choosing your stake, the first thing you will need to do is select the value of your starting card. Your are shown 5 face-down cards in front of you. You have up to 3 attempts to select a card that you are happy with. If you do not like either of your first 2 selections, you will be stuck with your third and final choice. Numbers range from 1 to 20. Guessing hi, low or same for the number of the next card. Guessing red or blue for the colour of the next card. You can make these wagers from one card to the next up to 18 times in one game (if you’re lucky enough). Winnings are rolled over and will increase at a greater rate the further you progress through the game. If you make an incorrect guess at any point, the game is over you lose your stake and all of your winnings. I guess that explains why it’s so infuriating when you end up losing after guessing low on 19. Mysic Shuffle Hi Lo bonus feature. First Bonus (cards 1 - 4). Second Bonus (cards 5 - 8). Third Bonus (cards 9 - 13). Fourth Bonus (cards 14 - 18). If your first correct guess reveals a red gem, you bonus multiplier will stand at 1%. If your next correct guess is a yellow gem, it will increase to 6% (1% + 5%). If you’re on your second bonus and you reveal a blue gem on your first guess, you bonus will stand at 4%. If you reveal red gems for your next 3 correct guesses, your total bonus will be 10% (4% + 2% +2% + 2%). In addition to the bonus payout, after every 4 or 5 correct guesses you are given the option of shuffling your current number for a better one up to 3 times. This option is only available after receiving each bonus payout.